In character movie promotions are very common these days and you can spot almost every bollywood celebrity dressed in character at promotional events. No one does fashion and and in character promotions better than Sonam Kapoor and for her recently released blockbuster Prem Ratan Dhan Payo sonam kapoor was seen in a series of ethnic looks at promotional events. The film which also stars Salman Khan has sonam kapoor playing the role of a indian princess and this means we get to see sonam kapoor delight us in traditional ethnic looks both on screen and offscreen . Here we put together her best ethnic looks for brides to take inspiration from. 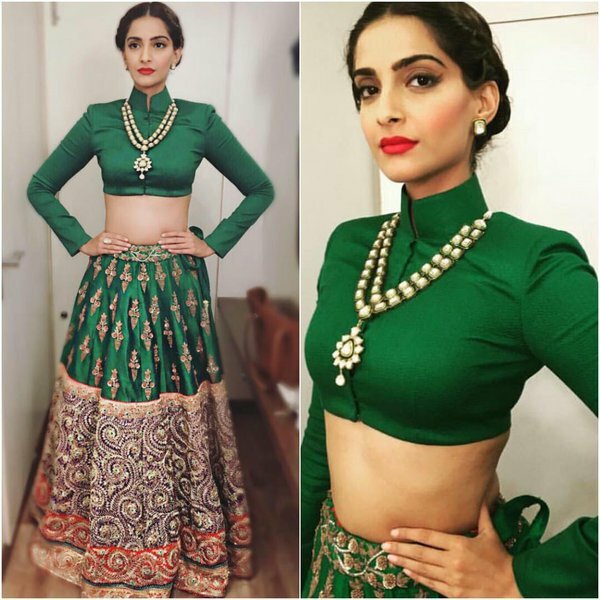 Be it mehendi or sangeet Sonam kapoor threw in a perfect look for every occasion as she promoted her movie. Even for non brides this post will serve as inspiration to dress up in style for the upcoming wedding season . In a Rohit bal Ensemble featuring an anarkali with slit and white lehenga sonam pormoted her movie at a jewelry store. Red lips , middle parted hair and gold earrings finished out this look. Personally i think the hair and make up was too severe here. The outfit was interesting and i would have loved a softer updo . At the success bash of PRDP Sonam was spotted in a biege Anavila handwoven saree with metallic borders. Silver jewellery from Amarapalli , middle parted hair and soft make up finished out this look. A crop top paired with a non traditional saree drape, trust sonam to mix things up and churn out hatke looks. The dull saree was well elevated with oxidised jewellery and iam totally loving this simple but different ethnic look. Jackets over sarees are an in thing these days but sonam kapoor tok things a notch higher by turning up in Rahul Mishra anarkali type pastel blue coat over saree. This can be a very tricky look to pull off but if you have it you go for it! In a floor length red Gaurang Anarkali with a contrast green dupatta sonam kapoor looked gorgeous . I Love the addition of chand Bali earrings here and the make up for perfect too . Side swept hair and gold juttis finished out this breezy look on Sonam kapoor. The styling here is just PERFECTION but i wish the anarkali had a better fit. A chirpy yellow suit paired with silver jootis spells comfort . This is something i would wear without thinking twice. Where to wear: Flaunt this look at the next summer wedding you attend but make sure you add a pair of huge jhumkas and contrasting glass or metallic bangles to make it more wedding appropriate. A Regal Green Anamika Khanna lehenga for promotions at big boss . Pairing an ornate lehenga with a cropped and collored front buttoned blouse sonam added a rajwada beck piece to complete the look. I felt this look was incomplete without the dupatta . 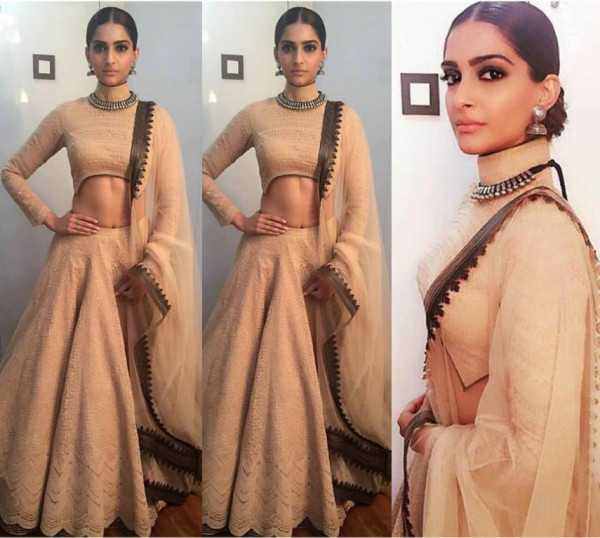 A biege Shantanu and nikhil lehenga with asymmetrical cut high neck choli looked amazing on sonam kapoor . I dont really like the colour but this is refreshing change from blinged out lehengas we see these days. The silver accesories were just perfect with this lookand the middle parted bun blended in well . Sonam is credited as being a Fashionista and trying looks which are different with a lot of edginess and that is exactly what sonam does in this payal khandwala outfit. A banarsi lehenga paired with contemporary cut out cape top paired with pearl choker , tikka and studs Sonam gives lesson on how to do fusion wear right. Where to wear: If you want to blend in traditional with contemporary the dramatic way for any of you pre wedding events try this. White for an indian wedding? trust sonam to inspire you into it! This pure white payal pratap saree was pure elegance . I of course would pair this saree with a different blouse but love the styling, the pop of turquose via the necklace and earrings and soft hairdo . Where to wear: This is an ethreal look to experiment with at someones wedding. This will also look great on bride or grooms mom . 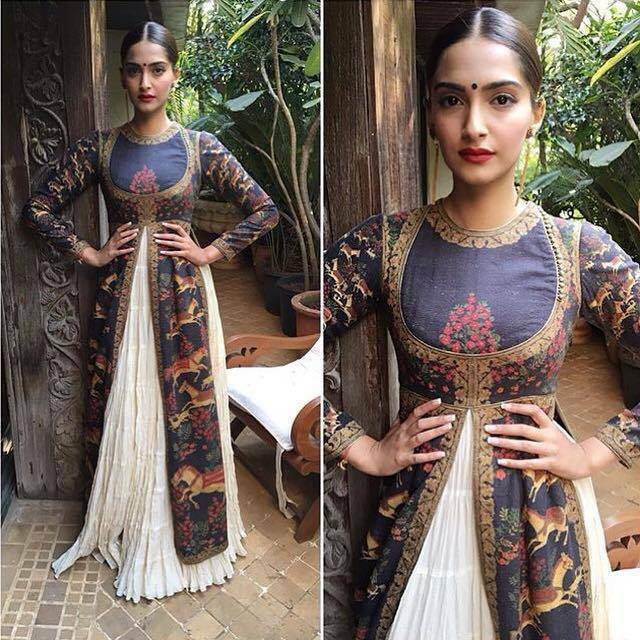 Did you enjoy the ethnic looks from sonam kapoor during PRDP promotions? I have to say that all these looks felt a bit too much just for movie promotions and i am waiting to see what sonam kapoor will end up wearing when she gets married!